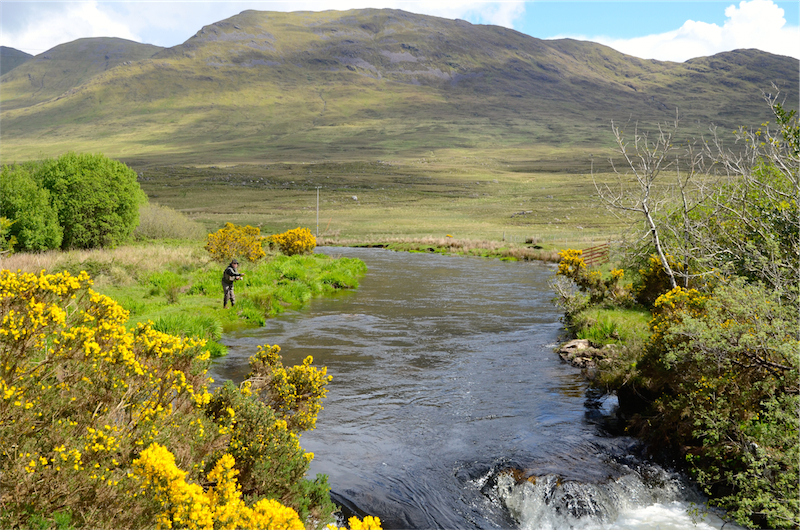 Fishing has improved here at Delphi in the past week, but more importantly the number of fish entering the system has improved dramatically, especially in the latter half of the week. Having said that fish were still playing hard to get, but we did manage to land fifteen for the week. It must be said that generally we had excellent water conditions on the river with water finally falling off to 30 on Saturday evening. George Westropp was first off the mark, last Sunday with a nice fish from the Stream on Finlough of 5lbs5ozs on a Verminator. Bill Williams managed to land a sea liced fish of approx. 5lbs in the Quarry pool on an Allie shrimp on Monday. On Tuesday we landed four fish. Mike Shortt had one off the Turn pool of 3lbs6ozs on a Collie Dog. Pat Timpson had one off Quarry Flats on a Cascade of 4lbs3ozs. Michael Righton then had an amazing hour at the head of the Turn pool between 9 and 10pm in torrential rain when he lost five and landed two, both on a Collie Dog, the first of 3lbs11ozs and the second of 7lbs1oz. Wednesday, Patrick Carroll had two off the Turn pool, both on a Collie Dog of 1lbs9ozs and approx.3lbs. Thursday belonged to the dynamic Northern duo of Alan Boyd and Ken McMillan who landed four for the day. Before starting one of them happened to startle three ladies who were skinny dipping. On exiting the water one of them suggested that it might be his lucky day. As it turned out they were right. Alan Boyd managed to land three fish; one from Morrison’s of 5lbs2ozs on a Cascade and two from the Quarry of 3lbs1oz and approx. 3lbs on a Yellow Shrimp and Cascade respectively. Ken McMillan had a fish of approx. 6lbs from the Kings on a Willie Gunn. Friday, Alan Boyd landed a big old springer of 10lbs4ozs from the Turn pool on a Beaded nymph. Saturday Paul Smyth from Tullamore finally got off the mark with two fish in quick succession from Quarry Run. They weighed in at 4lbs and approx. 5lbs and were taken on a Yellow Allie. On the sea trout front George and Helen Westropp had an entertaining afternoon on Glencullin with eight finnock to 1lb and a ewe. They noticed a ewe swimming across Glencullin and they did their good deed and towed her ashore.